This site is a full archived version of the original breakthroughcny.com website and is not currently active. 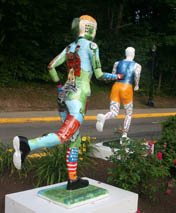 the 2007 Boilermaker Elite runners passing the Art on the Run sculpture at Valley View. Art on the Run is a project inspired by Breakthrough Central New York. Central New Yorkers aligned for extraordinary futures. To empower a breakthrough that transforms the future of Central New York. Generating Conversations of pride, hope and possibility, transforming all facets of life in Central New York. Hosting Breakthrough Leadership Workshops that bring together leaders representing a cross-section of the community. Partnering with the Breakthrough Leadership Workshop participants to continue the breakthrough process in a "Bridge to the Future." The Convention for the Future- the kick-off event for a 6-8 month regional visioning process was held on January 18, 2006 as a part of this process. The second, third and forth phases were held in March, May and October. All projects are more successful. Our community conversation empowers our future. Who we're being as a community shifts, and a new level of effectiveness results. The community resources and leaders are aligned to resolve critical issues. It is inspiring and energizing to live here. Our current community conversations are holding us back. As a community, our conversations are a mix of opinions, conflict, confusion, controversy, argument, and various levels of resignation which keep us from realizing what's possible. An extraordinary future is possible. We have the resources, workforce, the projects, and leadership in the public and private arenas with the courage and the vision to lead the way to a future that fulfills our vision. The key missing ingredient is the community-wide conversation for an extraordinary future in Central New York. You have the power to create this conversation as an idea whose time has come. Your stand for this conversation becomes real when you enroll in Breakthrough Central New York. Click here for more.